Kids can create a whole new world and bring their ideas and dreams to life every Saturday in our 12-Weekend 3D Animation Camps. With the opportunity to write, direct, animate, and edit their own 3D-animated short films, campers dive right in from day one and explore a high-tech, creative world of imagination, technology, and storytelling. Over the course of 12 weekends during the school year, campers survey the history of animation and the traditional animation pipeline, and learn the foundational techniques used in modeling, texturing, and animating both characters and environments. 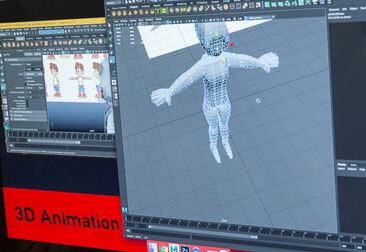 Courses focus on storytelling through the audiovisual medium of 3D animation, using industry-standard software and the latest generation Apple computers. Each three-hour class helps students design, storyboard, model, and animate a small scene of their own design. 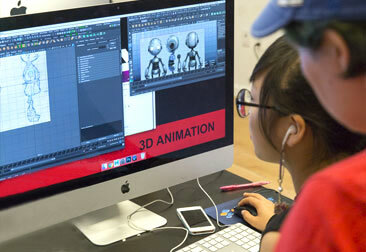 Each week, kids explore a new topic within 3D animation to build new skills and original work. Upon successful completion of camp kids will have created their very own original short animated films, celebrated in a special screening for friends and family.